The next three sections address these players and provide a bird’s-eye view of what they do. A database is an assortment of files that store data plus a handful of worker files that facilitate application access. The system global area, or SGA, contains data and control information from a single database instance. The program global area, or PGA, is part of the memory allocated to a 12c instance as it is started. Unlike the memory in the SGA, PGA memory is not shared. It contains data and control information specific to server processes, not the instance as a whole. The user global area, or UGA, is memory associated with each user session. Even though it is allocated from PGA memory, the UGA is discussed as one of the four main memory components. Software code areas are where SQL code is prepared for execution and sits in memory until used. It would be impossible to get into the details of each of these components; as you encounter the memory structures that support a running Oracle instance, the terminology will not be brand new. Figure 1 is a graphical representation of the bullet points just discussed with minimal drill-down. Auto memory management A maximum amount of memory that can be used is defined, and the instance self-manages the size of the assortment of SGA components. This approach is recommended by Oracle and first appeared in Oracle9i around the turn of the century; it is referred to as automatic shared memory management (ASMM). Manual memory management The administrator specifies fixed sizes for the components that make up the SGA; each component size is specified in the system parameter file as the 12c instance starts. Interaction with the database through the instance is brokered by system support processes introduced next. These processes are initiated automatically as an Oracle instance is started. Each one plays a role in the management of application interaction with the data. 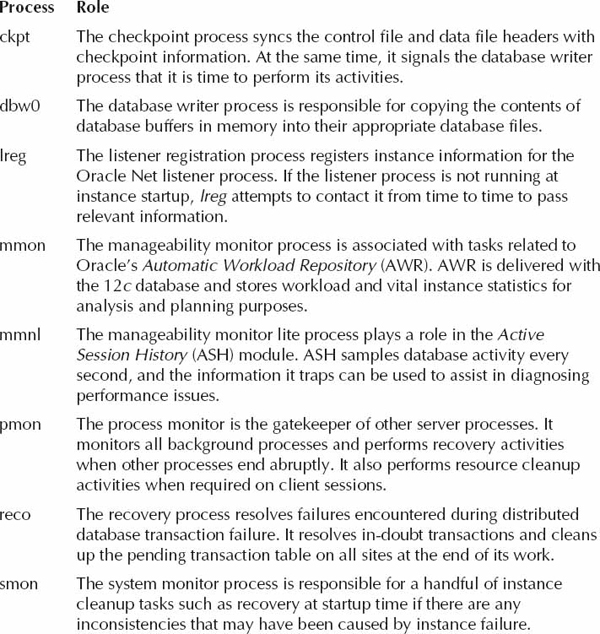 A full set of 12c processes from a running instance appears in Figure 2. 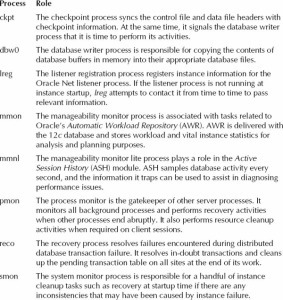 Table 1 presents some detail on the role played by each one of the highlighted processes. The suite of background processes that you see on a running Oracle Database 12c may differ from what was discussed in this section. Some processes only appear when certain functionality of 12c is being used. The next section wraps up the architecture discussion by giving some insight into the system files that support the 12c database. A minimum of 11 files are created for the traditional Oracle instance. Table 2 lists the role of each. Figure 3 illustrates the makeup of these operating system files, the barebones minimum as discussed in Table 2.